Freight forwarders handle the logistics for individuals and/or corporations to move large orders from the manufacture or ports to their final point of destination. Freight forwarding companies use N-Motion Freight everyday to ensure the safety and prompt delivery of their customers goods. N-Motion Freight works hard to build quality relationships with shippers of all sizes, from the ones that move entire shipments of cargo to the ones moving a single unit. Now that N-Motion Freight works directly with freight forwarders, there are fewer problems that can arise during the shipping process. Freight forwarders know that they can trust N-Motion because their professional staff has knowledge obtained throughout the many years in the business. Freight forwarders are companies or people that organize cargo shipments (freight or vehicles) for individuals or corporations to get large orders from the manufacturer to market. They are not typically trucking companies but are experts in supply chain management. In other words, they are third party logistics representatives for the freight industry. Freight forwarding companies will contract with asset-based trucking companies to move freight ranging from agricultural products to heavy haul equipment. Freight can be booked on a variety of transport types, including oceanic, airfreight, and railroads. In today’s economy it is cheaper to pay a higher price rather than going with the lowest price. It is better to pay a higher price for freight shipping then have to deal with the headaches that come along with the lowest price offered by a company that does not offer a high quality service. Whether its shipping overseas or locally, one must research every company to make sure the best quality of service will be provide at all times for the freight shipping rate. 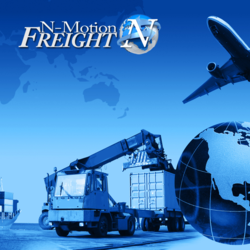 For more information on freight shipping solutions, call N-Motion Freight today!